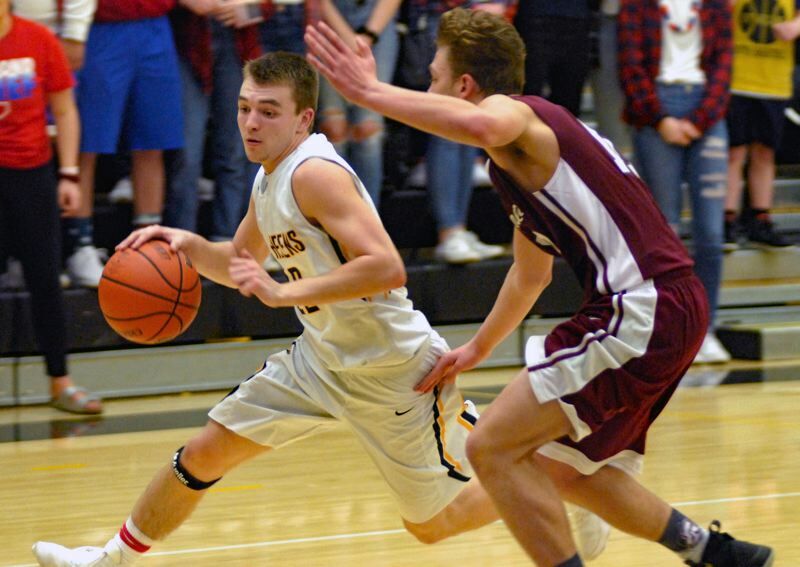 After losing four previous conference games by five points or less, the Sandy boys basketball team wasn't going to let Friday's contest at St. Helens slip away. Sandy's Colton Gorski hit the go-ahead layup with 32.1 seconds left on the clock to give Sandy a thrilling 74-72 win at St. Helens High School on Friday night. While Gorski had the winning bucket, Pierce Roeder was the star of the night for the Pioneers, scoring a game-high 28 points, while Kaleb Hubbard came off the bench to score 12 points, and Gorski and Wyatt Fisher also hit double-figures with 11 points apiece. St. Helens was led by Drake Dow's 21 points and Joe Rea's 18 points — the two combined to make 9 of 13 shots (.692) from behind the 3-point arc, while Jacob Falk added 16 points off his own in the loss. After the game, St. Helens coach Jordan Massinger said that his team's depth — they lost senior Devin McCall to a knee injury in the second quarter — played a huge role in his team's loss. "Any time you only play six or seven guys, the fatigue is going to mount," Massinger said. "A lot of it came down to some (3-pointers) just not dropping. If one or two of those go in, it's a completely different ballgame." The win allowed Sandy to move into a fourth-place tie with St. Helens in the Northwest Oregon Conference at 5-7, a fact not lost on Dow. "We knew this was a huge game for us," Dow said. "Being a senior, I was going to give it everything I had." The No. 23 Lions' third straight loss dropped them to 5-7 in NWOC play (11-11 overall), while the 19th-ranked Pioneers won for the second straight time and improved to 5-7 in conference play (8-14 overall). "I told the kids in the locker room how proud I was of them," Sandy head coach Jason Maki said. "We've had injuries, sicknesses, suspensions and a bunch of tough losses, but we have kept fighting and that toughness and ability to overcome adversity was shown tonight." The Pioneers scored the first six points of the game and forced Massinger to use an early timeout. The 30-second breather worked in the Lions' favor as they finished the period on an 18-5 run to take an 18-11 advantage into the second quarter. But that's when Sandy decided to turn up the tempo a couple of notches. "Our goal was to wear them out a little bit," Maki said. "We wanted to play nine or 10 guys because we knew we had more depth than them. … I told the guys that if we emphasize our running, we will win this game. It made a huge difference." Despite the Lions holding a double-digit lead at one point in the second period, the cutthroat pace allowed the Pioneers to score 31 points in the quarter. Gorski came off the bench to score eight points in the frame to get the Sandy offense going, then Roeder caught fire and finished the half with 10 straight points to put Sandy on top 42-38 at halftime. McCall's knee injury early in the second quarter ended up playing a big factor in the Lions' lineup rotations. Roeder continued his hot shooting in the third quarter, hitting three mid-range jumpers to help Sandy maintain their lead. "(Maki) told me that I needed to step up my game and I feel like that made me come out more aggressive," Roeder said. "I feel like we're getting really good team chemistry late in the season. Everyone is playing with heart." But Roeder wasn't the only one bringing the offensive firepower in the second half. Dow nailed two deep "threes" late in the quarter — including an NBA-range heave before the buzzer sounded — to give the Lions a 61-59 lead heading into the final period. The seesaw battle continued well into the fourth quarter. A pair of free throws from Roeder put Sandy up 72-69 with 2:02 left in the game, but St. Helens tied the game again on another clutch 3-pointer from Dow. After a defensive stop by Sandy, Sandy called a timeout with 38.6 seconds left and Maki decided to get something going to the hoop right away. "We knew that they were probably going to overplay Colton and stay tight with Hubbard because he had hit a couple of (3-pointers)," Maki said. Sandy point guard Colby Carson took the inbounds pass at the top of the key to start the play. Gorski came up like he wanted to get the ball on the wing, then snuck past the defense with a backdoor cut. Carson hit him with a perfect pass that sliced between two defenders and Gorski finished the layup to give the Pioneers the 74-72 lead. "That's our bread and butter. We work on that all the time," Gorski said. "Colby threw a perfect pass and I just had an easy layup." Roeder almost negated the layup by fouling Dow in the backcourt on the Lions' ensuing possession, but Dow missed the front end of a one-and-one to give the ball back to the Pioneers. Dow, however, redeemed himself just seconds later. After Dow's missed free throw, St. Helens fouled immediately, and when the Pioneers inbounded the ball from the sideline, Dow came out of nowhere to poke the ball away from Roeder. His steal, with 20 seconds left, set up one final opportunity for the Lions. With no timeouts left, Dow dribbled by midcourt and looked to the sideline for about 15 seconds, then started to make his move. He was cut off by Fisher, so he kicked it out to Rea for an open 3-pointer that would have won the game — but Rea's shot hit the front rim and bounced off, sending Sandy into celebration mode. "I was trying to get the hoop, but (Fisher) played really good help-side," Dow said. "Joe is one of the best shooters in the league, so I had to give him the ball and give him a chance. It didn't go in, but that's just how it happens sometimes." In upcoming games, St. Helens plays at La Salle at 7:15 p.m. Tuesday, then hosts Wilsonville at 7:15 p.m. Feb. 23.